The gold flake polishes are quite common now. But the silver flakes have been harder to find. 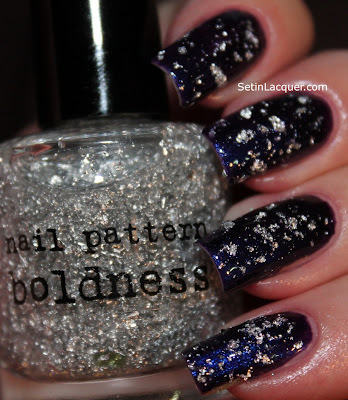 Nail Pattern Boldness has released a silver flake polish called "Tin Man." 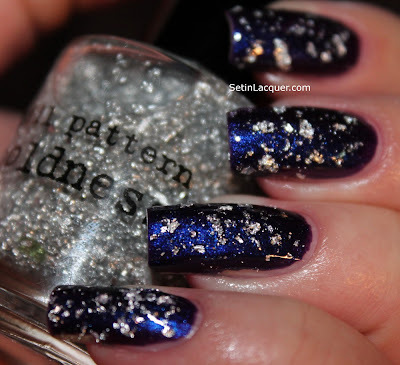 This top coat is packed full of silver flakes. I am not sure exactly what the metal is or even if it is truly silver. But it is a pretty flake regardless. The flakes are large silver flakes and appear crinkly. This makes application a little harder as they don't always lay flat. But I didn't have to fish for the flakes and they applied evenly. I applied Tin Man over Venique Wrapped in Jewels. Nail Pattern Boldness Tin Man silver flake topcoat over Venique Wrapped in Jewels. Have you tried gold or silver flakes yet? Which is your favorite? Tin Man can be purchased at Llarowe.com for $10 when in supply. This polish was purchased by be and all opinions are my own.